The results are in! We’ve tallied up all of your votes and are proud to announce the Gollancz 50th Top 10 as chosen by you! The Top 10 titles have all been beautifully repackaged in cool retro editions that follow the classic Gollancz yellow jacket style. They’ve got brand new introductions from outstanding top genre authors; Joe Abercrombie, Stephen Baxter, Stephen Deas, Peter F. Hamilton, Paul McAuley, Richard Morgan, Alastair Reynolds, Adam Roberts, Justina Robson and Chris Wooding. How better could we celebrate our 50th Anniversary?! Look for all of our Top 10 titles from 1st September where all good books are sold. Visit the Gollancz blog all this month for features from our editors and authors talking about our Top 10 titles and our 50th Anniversary. If you’d like to learn more about Gollancz, visit the history and timeline of publications page. Find out all about our forthcoming publications with our Gollancz Newsletter, Twitter and Facebook profiles. You can view the 50 shortlisted titles below. BMD Books is selling a signed first edition of The Shadow of the Torturer for $180. Thought it might interest a few collectors out there. Leather – Printed on mouldmade Saunders Waterford. Bound in full goatskin leather with the color illustrations and a map enclosed in a cloth traycase with an extra set of unbound prints. Limited to 14 copies for sale. The full omnibus includes: The Shadow of the Torturer, The Claw of the Conciliator, The Sword of the Lictor, The Citadel of the Autarch, The Urth of the New Sun and The Castle of the Otter. The illustations were created by German artist Alexander Preuss and judging by the few samples I’ve seen they look remarkable.Only 13 copies of the leather $1500 bound version are being made, but there is a $225 cloth version that, although doesn’t include as much, is being printed up 300 times. Be sure to check out their site for a more complete description. Makes me wish I had $1500 sitting around. Finding a copy of Michael Andre-Driussi’s Lexicon Urthus may be difficult since it’s been out of print for almost 5 years now. You’ll be dropping almost $200 for a used version. The good news is that Sirius Fiction plans on a printing a second edition. The bad news is that it won’t be out until maybe 2009. 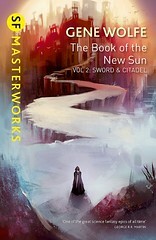 So where do you find some good info on Gene Wolfe’s Book of the New Sun until then? Well it still involves buying a used book but for a lot less money. The Generic Universal RolePlaying System (or GURPS) is a fantastic set of rules for running a good pencil and paper Roleplaying Game that was created by Steve Jackson and it just so happens that they publish a rule book for running your GURPS game in Gene Wolfe’s New Sun world. Here is where it gets good. The book was also written by Michael Andre-Driussi and only costs around $10. Now it’s by no means the Lexicon Urthus but it is full of a lot of great information concerning the Books of the New Sun, Long Sun and Short Sun. It discusses anything a gamer would need to set up and play an RPG in the New Sun world including information on various races, moments in history and the many different places we’re introduced to in Wolfe’s books. If you play GURPS it’s a great suppliment and if you don’t, well, it may be worth having for your Gene Wolfe collection. I know I enjoyed flipping through it.